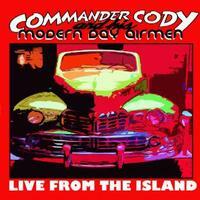 There aren’t any big surprises on this live recording from Commander Cody. Instead, we get a killer slab of Americana that runs the gamut from Zydeco to Rockabilly, Boogie Woogie and more modern sounds. It’s all energized and powerful. It’s quite an entertaining set. In other words, it’s just plain fun. This is a smoking hot rock and roll tune. It’s a great way to start the set in real style. There’s some smoking hot guitar soloing and everyone puts in inspired performances. There’s a little mini drum solo at the start here. Then they launch out into another killer rock and roll tune. We get a great retro keyboard solo in this thing. They turn things to boogie woogie here. There is also a bit of Zydeco in the mix. Here we get something that’s more of a straight forward rocker. That said, there are some elements that seem not that far removed from progressive rock at times. Rockabilly is the order of business here. And business is good. Straight ahead rock, there’s some cool keyboard soloing on this number. It’s got a bit of jazz meets rockabilly vibe at times. While everything here is of equal quality, the style changes to more of a Grateful Dead kind of rock music. It’s a classy and classic sound and works very well. Here’s another killer rocker well rooted in old time music. Again the keyboard soloing is noteworthy, but so is the guitar soloing. The Commander and Company take us on a fun ride on this reworking of an old classic tune. I like this version a lot. In fact, I might like it better than the original. This slice of old time rock and roll features little mini-solos from various members of the group as a showcase kind of thing. It’s classy and tasty. Zydeco meets an almost Johnny Cash type of country music on this show-stopper. It’s a lot of fun and features some more killer performances all around.